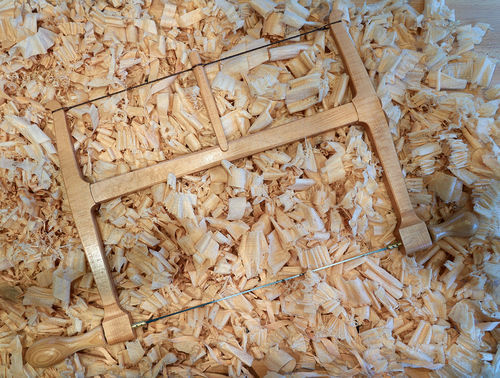 Hand made Turning saw based on the Gramercy tools kit which I’ve had for absolutely ages and finally decided to make. The kit I bought comprised of the handles, pins and three blades. The wood used is quarter-sawn European beech. I believe Gramercy make the handles from American hickory. 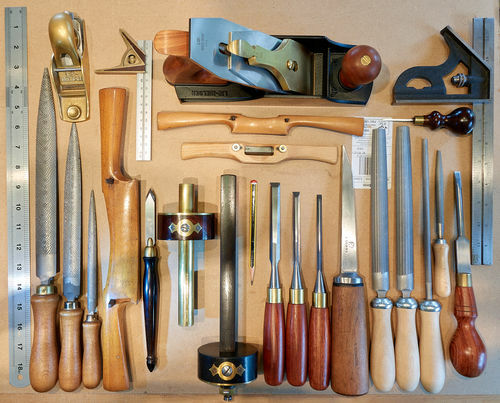 Excluding the saws, here are the tools I used to make it. The finish is one coat of Liberon Finishing Oil and one coat of Briwax Clear Wax. It was a really enjoyable build and a great exercise in shaping with rasps, files and spokeshaves. Highly recommended weekend project. Awesome. But I think you need to clean your shop :) there is a huge pile of shaving under your saw. Beautiful tool Frank. I hope that you will also add your name, and the date on the tool for future reference. Fridge – Sorry old boy, I’ll try to do better in future. John – Thanks, but who’s Frank? LOL. I’ve answered to a lot of names, but that’s not one of them. I’m Andy. Very clean work on the hand shaping Andy! I need to get some nice rasps sometime. Very nice. How’s the balance? How does it feel? That’s a nice little kit. Got one hanging on my wall waiting for a winter weekend of shaping parts. Well executed. Absolutely SUPER! My, my I’m inveous. Wonderful job and really nice beech. QS beech is hard to find in the U.S. What are the dimensions of the saw? This is a very nice shop made saw. Duck – Thanks. Actually there is a lot of room for customizing this saw within reason. There are really only two critical measurements. 1) The length of the beam at the mid point of the tenon shoulders and 2) the width of the arms where the brass pins go through. Get those right and the saw will tension correctly and work. Everything else is open to a bit of tweaking if desired. Ron – I’ve only done a couple of cuts with it so far, but it felt fine. There is a bit of a problem in the design in my opinion and that is that the brass pins are the same diameter all the way along their length. On an older Marples bowsaw that I have, the pins are tapered and that (when under tension) prevents the body of the saw from turning inadvertently when you tip the saw more than say 45 degrees from vertical. My pins fit very tightly, but the weight of the body is enough that you have to use your first finger to support the weight of the body to stop it rotating. Of course, it would be difficult for Gramercy to offer a kit with tapered pins as not everyone has a tapered reamer to make a tapered hole. Not a massive problem, but something to look out for. I’ll see how it goes, but I might add a couple of grub screws to prevent the body turning once I’ve set it. Dave – Thanks. You’ll love it. I found it quite absorbing once I got into it. Colonel – Thank you. The arms are 12” high and the saw is about 15 1/2” wide plus the handles. You can download the PDF plans for the saw from Toolsforworkingwood.com. The plans are good and can be used at templates if you print them out 1:1. Ron – I ve only done a couple of cuts with it so far, but it felt fine. There is a bit of a problem in the design in my opinion and that is that the brass pins are the same diameter all the way along their length. On an older Marples bowsaw that I have, the pins are tapered and that (when under tension) prevents the body of the saw from turning inadvertently when you tip the saw more than say 45 degrees from vertical. My pins fit very tightly, but the weight of the body is enough that you have to use your first finger to support the weight of the body to stop it rotating. Of course, it would be difficult for Gramercy to offer a kit with tapered pins as not everyone has a tapered reamer to make a tapered hole. Not a massive problem, but something to look out for. I ll see how it goes, but I might add a couple of grub screws to prevent the body turning once I ve set it. Thanks, Andy … that’s good to know! There is a bit of a problem in the design in my opinion and that is that the brass pins are the same diameter all the way along their length. On an older Marples bowsaw that I have, the pins are tapered and that (when under tension) prevents the body of the saw from turning inadvertently when you tip the saw more than say 45 degrees from vertical. My pins fit very tightly, but the weight of the body is enough that you have to use your first finger to support the weight of the body to stop it rotating. Thanks, Andy … that s good to know! That is interesting and something I never thought about. I wonder if there isn’t another way to index the blade to prevent this. Stunning job, Andy. Looks perfect.